NIA WHITE BELT TEACHER TRAINING COURSE!! For details on the schedule, check the Group Classes This Month and Group Classes Next Month pages on this website. 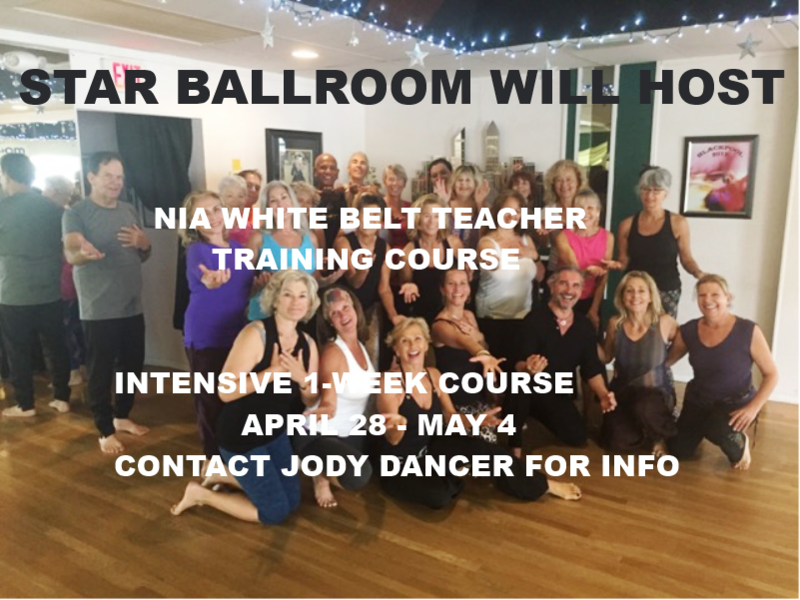 This Intensive Course will be taught by Gail Condrick, certified NIA Teacher Trainer, and hosted by Jody Dancer, who is the only certified NIA Black Belt Teacher in South Florida. The levels of NIA training start at White Belt and progress to Black Belt, which is the highest level. Nia is a dance fitness program that provides a great way to enjoy moving to music while exercising the whole body. The acronym “NIA” originally was used to mean “Non-Impact Aerobics,” but, the concept has evolved and grown. Jody explains, “Nia is a Fitness Fusion of Martial Arts, Yoga and Dance.” “In our classes, I use ‘Nia’ to mean ‘Nine Adventures in Dance!’ Jody says. 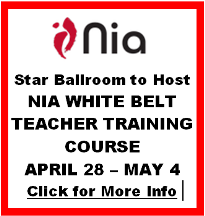 For more information or to register for the Intensive One-Week NIA White Belt Teacher Training Course at Star Ballroom, go to www.NiaNow/white-belt. NIA Group Classes with Jody Dancer are offered at Star Ballroom every Tuesday, Thursday, and Saturday at 10:00 am, and will also be offered at 10:00 am every day of the Intensive One-Week Nia White Belt Teacher Training Course at Star Ballroom from Friday, April 28 through Thursday, May 4 (except for Monday, May 1). To learn more Visit www.JodyDancer.com and Contact Jody Dancer at 954-782-7760 (Studio) | 954-383-9667 (Cell), or JodyDancer@yahoo.com.